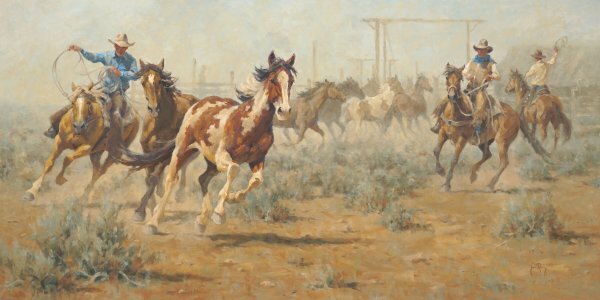 Jim Rey loves painting all the action of the cowboy way of life. These cowhands are working hard to round-up a couple stray horses from their herd. Cavvy, derived from cavvietta in Spanish, means a herd of horses owned by a ranch. Cavvy marks, different kinds of trims on horses' manes, indicate their level of training, and are also used to identify them if they stray or become mixed with a herd of wild mustangs.